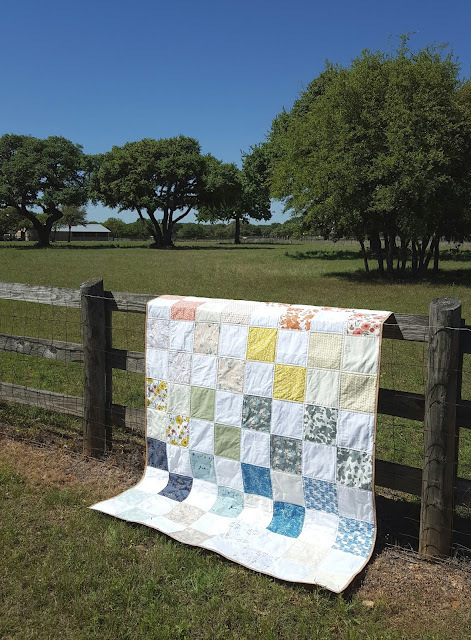 The first time I saw my brilliant friend Sharon Holland's new Bountiful collection for Art Gallery Fabrics, I thought, "She drew Texas!" Over and over again as I sewed, I felt as though I was l working with scenes from my own neighborhood in the hill country. Sharon has created a beautiful set of designs that feature a soft rainbow of colors and lovely pastoral themes. I quickly decided that I wanted to go old school with my quilt, settling on a simple four patch block set against a quiet background. I paired Sharon's prints with a pure white solid, tossing in a few cream colored squares for interest. 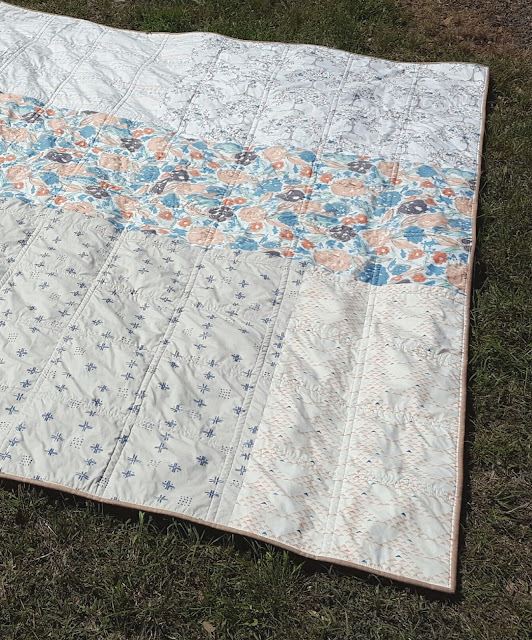 I quilted a quarter inch from each side of every seam, and for my backing, I used prints from Sharon's Tapestry collection which blend perfectly with the colors of Bountiful. 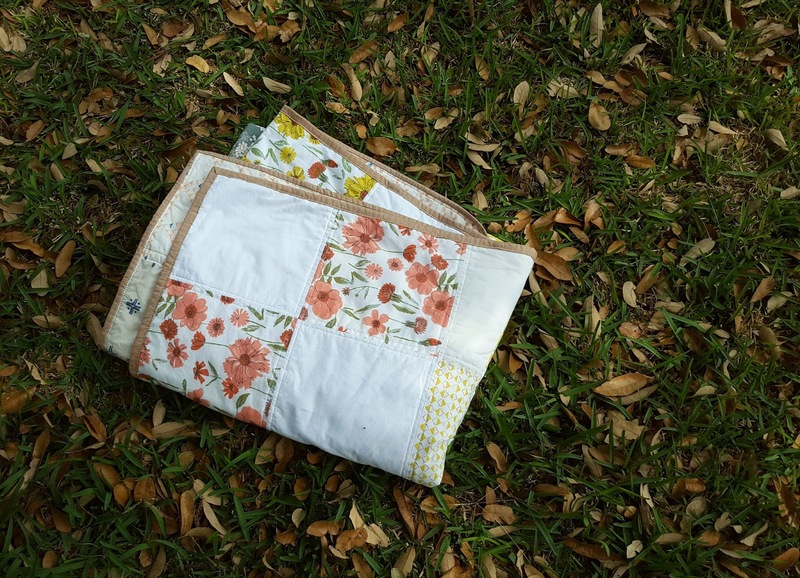 The quilt is bound in my favorite shade of AGF linen, Adobe Clay. I love using linen binding on quilts whenever I can. It's such a nice detail and makes a great contrast with the quilting cottons. My oldest daughter is absolutely thrilled to be getting this as her new bed quilt for the spring and summer months. It's sweet and just a bit more grown up than anything else I've made for her. I think it will serve her well in the years to come. She and her sisters had a ball taking the quilt outside for playtime yesterday. They decided that it makes a lovely spot to sit outside in the fresh spring air. It was such a joy as always to work with Sharon's fabric. Be sure to visit the other stops on the Bountiful tour listed below! Very cute quilt. What size blocks did you use? Beautiful quilt - and lovely setting with all the pictures. 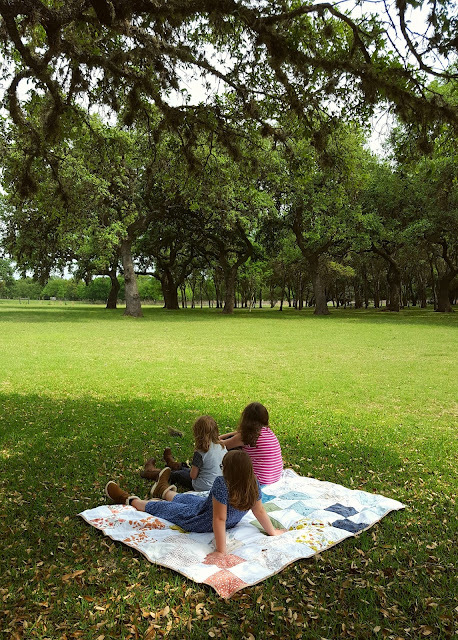 A quilt made with love for your oldest - special! I like the simple design of your quilt. It's very restful. I never thought of using linen for a binding. I think I will try that! We got lots of rain here in north Texas on Sunday. Glad you had pretty weather for your pictures. THey are lovely. Heidi, thanks so much for being part of my Bountiful blog tour! 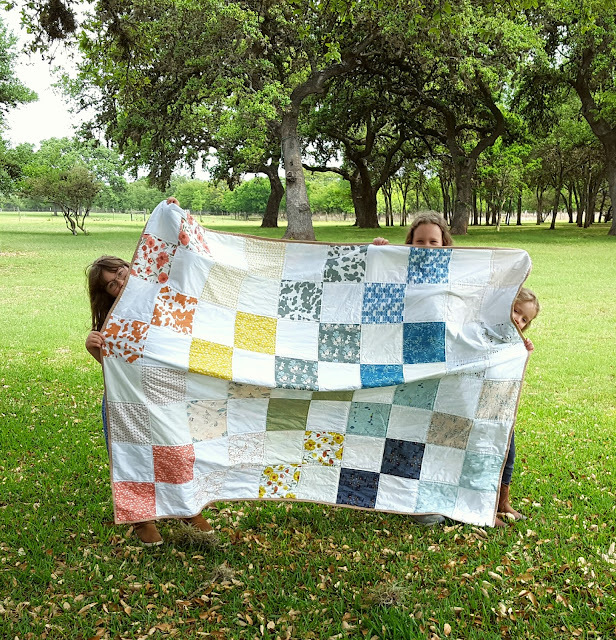 I love that these prints remind you of Texas and that your oldest will be enjoying your lovely quilt on her bed. Big hugs to all of you! I like your quilt - very nice! and your models are very cute! 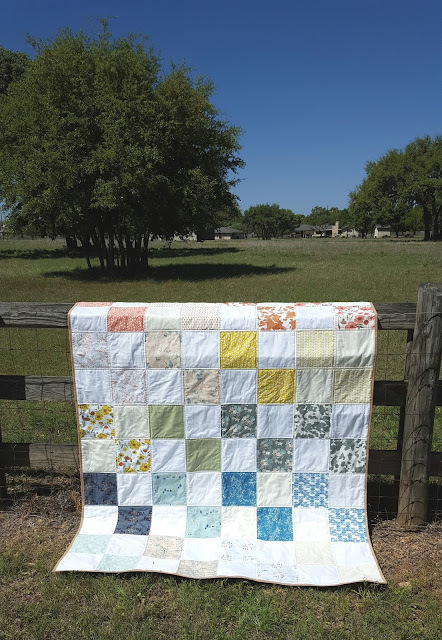 I love the simplicity of this beautiful quilt. You did an amazing job showing off those gorgeous fabrics!